Details relating to the Vatican Commemorative of 2017. This coin commemorates the 1950th anniversary of the martyrdom of Saint Peter and Saint Paul. 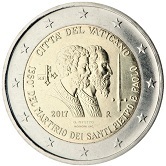 The motif of the coin depicts St.Peter on the left and ST. Paul on the right, both looking to the right. Next to St.Peter are keys, these symbolizing his role of opening the gates of paradise to those allowed in. Next to St.Paul is a sword. This was perhaps chosen as the Roman emperor Nero had him executed by the sword or perhaps as symbolizing St. Paul as a great fighter for the Christian cause. Around the edge of the inner circle from ten to two o’clock is the country designation -CITTA DEL VATICANO. There is a further inscription around the edge of the inner circle, running from nine to three o’clock anti clockwise.”1950 DEL MARTIRIO DEI SANTI PIETRO E PAULO”. (1950 the martyrdom of the saints Peter and Paul). At the bottom left is the year of issue 2017 and at the bottom right is the mint mark R. Under the image of the saints is the name of the designer “G. TITOTTO”. Return from Vatican Commemorative 2017 to euro coin collector.